Did you know that an Irish America soldier was responsible for turning the tide of the most important battle of the American Revolution? His name was Timothy Murphy and he had served with distinction on the frontier, was part of General William Thompson’s Pennsylvania Rifle Battalion which became the First Continental Regiment and he served with famed General Daniel Morgan as a sharpshooter. He was considered the most famous marksman of his day. Timothy Murphy was born in 1751 near the Delaware Water Gap to Thomas and Mary (Lundy) Murphy, recent immigrants from Co. Donegal, Ireland. When he was 8 years old, his parents moved further west, settling in an area known as Shamokin Flats, now the town of Sunbury, PA. Young Murphy was apprenticed to the wealthy Van Campen family and went with them to Wyoming County, PA – an area that was a wilderness at the time. There, he was exposed to frequent Indian raids and grew up as an accomplished frontiersman. In 1772, American patriot groups began disputing the actions of the British Crown, leading to a Provincial Congress in most of the colonies and culminating in 1774 with the unifying First Continental Congress. In response to patriot protests in Boston over British authority, Parliament sent combat troops. Consequently, the colonies mobilized their own militias and by 1775, were in open rebellion. Timothy Murphy and his brother, John, enlisted on June 29th, 1775 in Captain John Lowdon’s Company of Northumberland County Riflemen. History was fortunate that one of Timothy’s companions, Aaron Wright, kept a diary that recorded their adventures. Lowdon’s Company was sent to Boston where Murphy participated in the siege of Boston. He also served in the Battle of Long Island, the Battle of White Plains and the retreat across New Jersey crossing the Delaware with Washington. As a Sergeant in the 12th Regiment of the Pennsylvania Line, he served at Trenton, Princeton, and New Brunswick. An expert marksman (able to hit a seven inch target at 250 yards), Murphy qualified for Morgan’s Rifle Corps, and was transferred to that elite organization in July 1777, shortly after its inception. 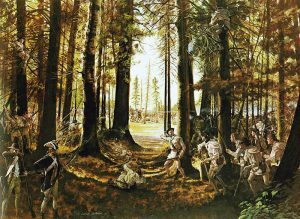 In August of that year, Murphy was one of 500 hand-picked riflemen sent north to reinforce the Continental forces opposing General Sir John Burgoyne’s invasion of northern New York. It was at the Battle of Bemis Heights (Second Battle of Saratoga) on 7 October 1777, that Murphy became a part of American history. As the battle raged, the British, having been pushed back, were rallied by Brigadier General Simon Fraser and were on the offensive. General Benedict Arnold (still loyal to the American cause at that time) rode up to General Morgan, pointing at Fraser shouting: that man on the gray horse is a host in himself and must be disposed of. Morgan gave the order for his best marksmen to take him out. Timothy Murphy climbed a nearby tree, finding a comfortable notch to rest his rifle, took careful aim at the extreme distance of 300 yards and squeezed off a shot. General Fraser tumbled from his horse, shot through the midsection. He was taken from the field and died the next day. Another British Senior officer, Sir Frances Clarke, General Burgoyne’s chief Aide-de-Camp, galloped onto the field and Murphy’s second shot dropped him. He was dead before he hit the ground! These two unerring shots did more than anything else to shatter the morale of the British and break their offensive; it turned the tide of the most important battle of the Revolution. As soon as General Fraser fell, it threw the British into disarray as panic spread among the British lines allowing the appearance of American General Tenbroeck and 3,000 New Yorkers. General Burgoyne personally took command of the area, but could not rally his demoralized men. The British line caved in as men scrambled for the entrenchments around their camp. These two well-placed shots earned Timothy Murphy the nickname ‘Sure Shot Tim’ and won the battle that turned the tide of the war. Early in 1781, Murphy served under Irish-American General ‘Mad’ Anthony Wayne (so nicknamed because of his tactical boldness and courage in the field), fighting against Lord Cornwallis across Virginia. Finally, when joined by Washington’s main army and the French, Murphy was part of Cornwallis’ defeat at Yorktown. placed a marker commemorating Murphy at the Saratoga Battlefield, and the state put up its own marker there in 1929. 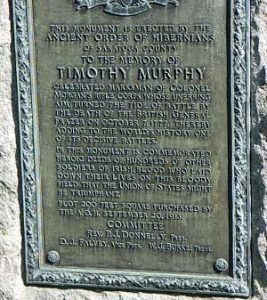 In dedicating that monument, Governor Franklin Delano Roosevelt said: This country has been made by the Timothy Murphys, the men in the ranks. Conditions here called for the qualities of the heart and head that Tim Murphy had in abundance. Our histories should tell us more of the men in the ranks, for it was to them, more than to the generals, that we were indebted for our military victories. Timothy Murphy’s life is the subject of John Brick’s 1953 novel, The Rifleman and he is one more of the Irish-Americans who helped to shape his country.